﻿﻿ Our Military project is nearing completion. All the photo editing is done, and most of the photos are printed and trimmed. 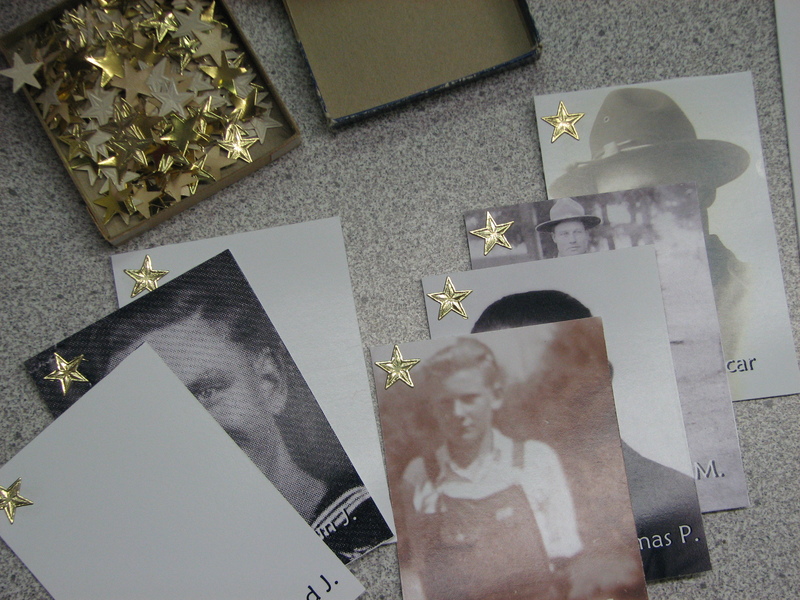 Today I started adding the gold stars on the photos of those who died while in service. Some of the “photos” of the Gold Star soldiers are blank sheets with only their name, since we do not have a photo in our collection, but want to honor them anyway. One of the saddest Gold Star photos is the one of the young boy in overalls. We don’t know, but often wonder if this is the only photo his mother had of him before he left for war – never to return. We do know that his name is Roy C. Anderson and he died in the Bataan Death March in WWII. While I have several wonderful people helping me with all aspects this project, I have saved the task of placing the stars for myself. I have 3 pages of names that need stars added to their photos, but want to personally take a small moment for each of them to consider their sacrifice. 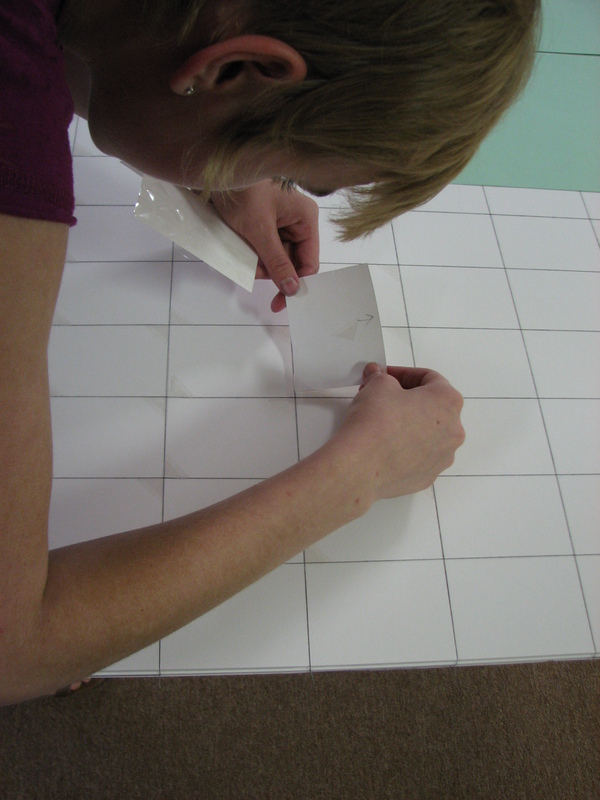 Katrina, Merlin and Phyllis have been busy putting the photo corners on the 4 x 8 sheets of archival foam core. 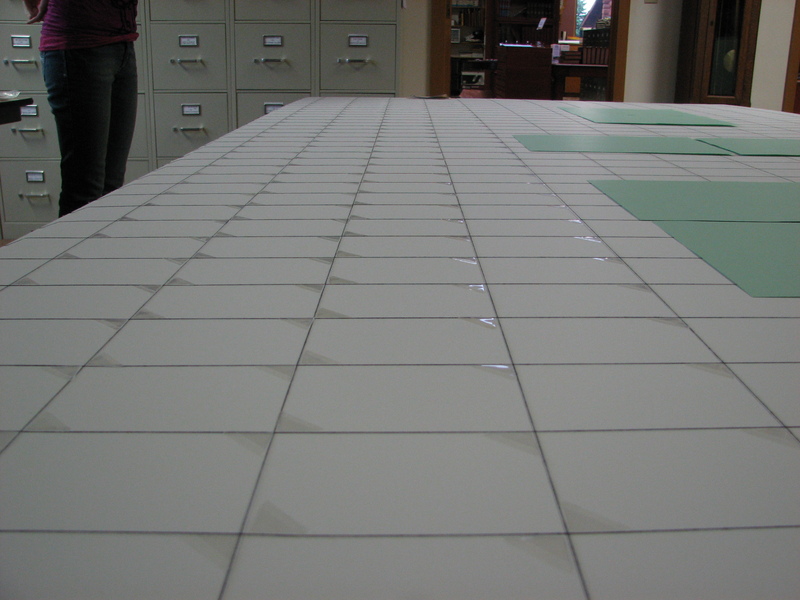 The dark lines are threads stretched across the board. This keeps us in line without needing to erase pencil marks. This entry was posted in Collection Notes, Museum updates and tagged exhibit, military, museum collection, Pope County, Pope County Minnesota, Pope County Museum, veteran, Veterans exhibit. Bookmark the permalink. Thanks to you and your staff for all the hard work you are putting into the Veteran’s Project. I look forward to visiting the museum with my wife and son over the 4th of July Weekend. I’ll be here on Friday, if you are in town by then. I may have more photos of Roy C Anderson but am currently searching family records to confirm my relationship. Thank you for your comment! Thanks to this blog post, we have been contacted by other family members and have a few more childhood photos of Roy with his brothers Bennie and Hjalmer. It is wonderful that technology is helping us find family members.